ExcluDoor® 3 Mk3 FR with fire-rated vision panel. Fire rated for up to four hours and can incorporate a high security ExcluGlass® 4 vision panel with both one and two hour fire rating. Can be supplied with push pad or panic bar options. Large range of locking options available across the range of single and double lead doorsets. Tested in accordance with BS EN 1634-1: 2008 and LP1056: Issue 7. 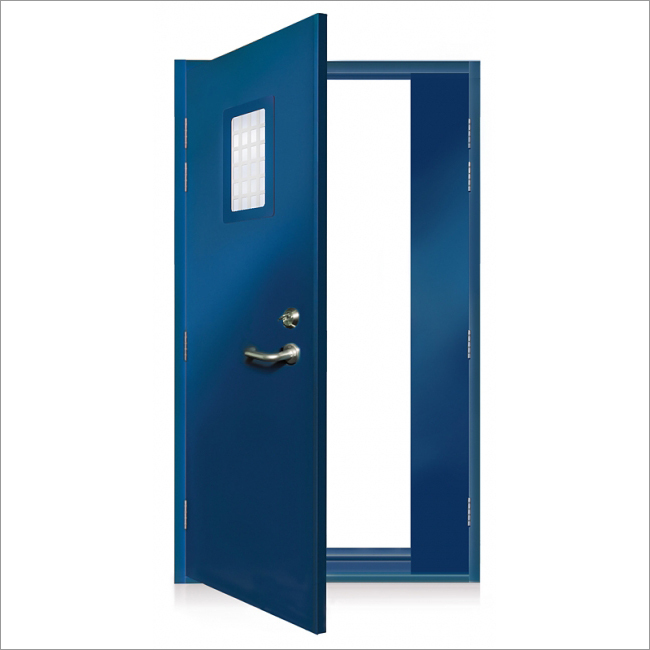 Available as single leaf, double leaf or un-equal double leaf doorset. Tough recessed stainless steel hinges with anti-crushing fixing. Material: 1.5mm electro-zinc coated steel incorporating an additional internal drill resistant steel protection plate in attack face. High security slimline multi-point locking from Surelock McGill with a range of certified locks and emergency escape furniture. ExcluGlass® 4 vision panel with both one and two hour fire rating, in compliance with BS EN 1634, can be fitted. Many optional extras are available including external ‘D’ pull handles, lever handles, ring pull, weather/smoke seal, kick and push plates, overhead door closers, heavy duty door stays, alarm contacts and electronic lock status monitoring. Emergency escape option with push pad.